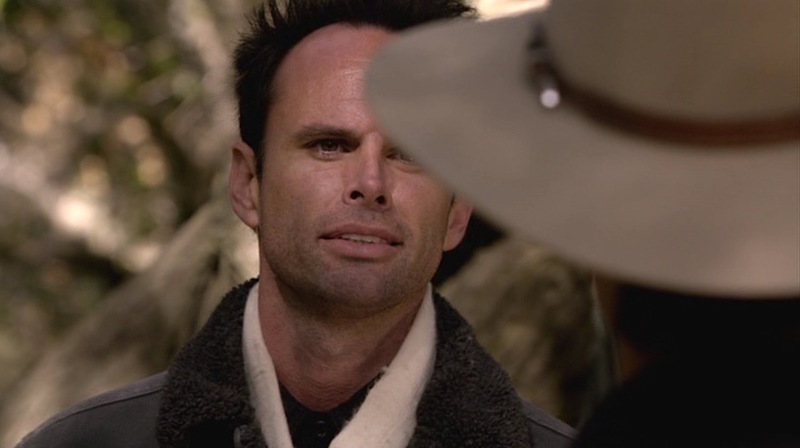 Walton Goggins as Boyd Crowder on FX’s Justified. Fresh out of prison, Harlan County’s wiliest and wittiest criminal mastermind Boyd Crowder finds himself in the backwoods of his old Kentucky home, teaching his particular brand of religion to a congregation of redneck drug slingers. Not satisfied with having shot him in the chest earlier that year, Deputy U.S. Marshal Raylan Givens shows up and rubs proverbial salt in Boyd’s wound by reminding the “congregation” that there is a standing $50,000 reward for anyone who can provide information sending their new leader back to prison. Boyd leads his backwoods brethren by layering comfortably for the brisk fall weather. 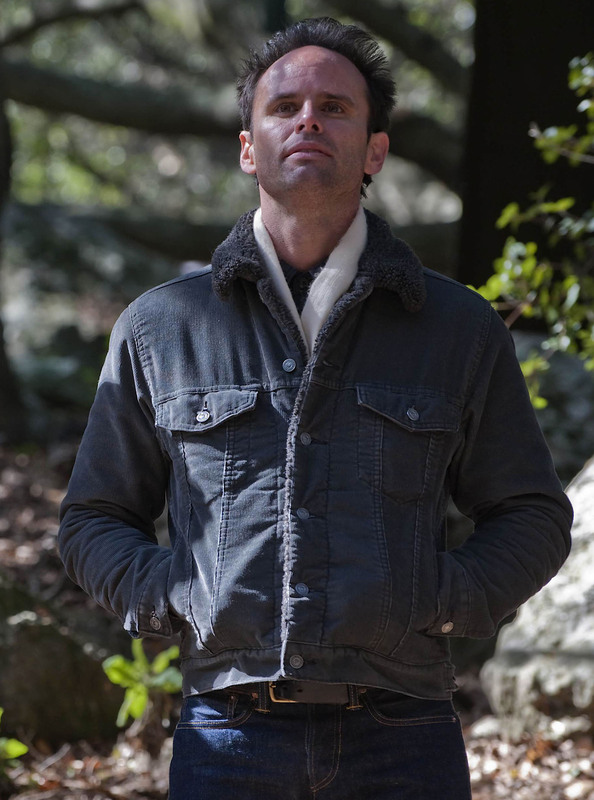 The main staple of his attire in these episodes is a dark gray thin-wale corded jacket with black fleece insulation that extends over the collar; Levi calls this style a “sherpa trucker jacket” and their similar product can be found for $98 online. Boyd’s “sherpa jacket” is apropos for his new status as a mountain man. Boyd’s fleece-insulated trucker jacket has six silver-toned metal buttons down the front with a single button to fasten each cuff. Each side of the waistband has a short tab with two buttons to adjust the fit. The metal buttons of Boyd’s trucker jacket are best seen when he’s accepting this thoughtful gift from his loving father. The two patch pockets on the chest have pointed bottoms and close with pointed flaps that each close with a single button. A double front yoke detail extends down each panel, starting under the pocket flap and slightly tapering toward each other before meeting the waistband. Each side of the jacket features a vertical welt pocket used as handwarmers. 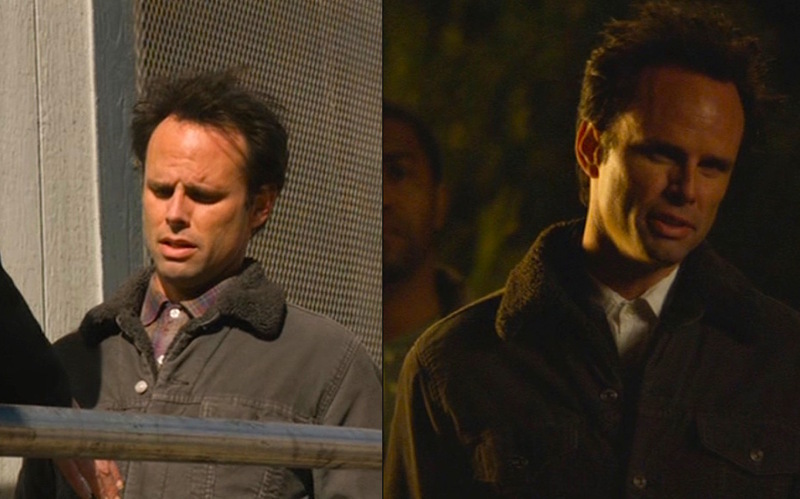 It is interesting to compare how Boyd and Raylan wear their trucker jackets in cooler weather. 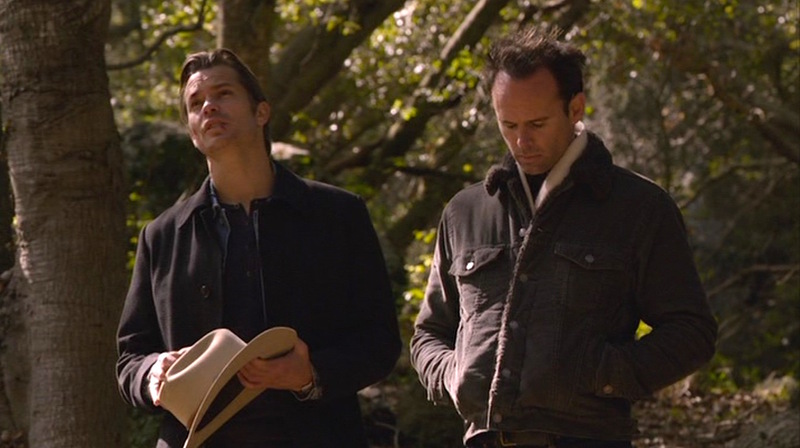 A stoic lawman in the tradition of the Old West, Raylan sports the same blue denim jacket as usual but wears a dark wool long coat over it as an extra layer against the cold. Boyd, a criminal used to life on the run, minimizes by wearing one thicker, isolated jacket. Harlan County’s finest meets Harlan County’s most wanted. If he does need an extra layer, Boyd wears a cream-colored wool scarf around his neck and under his jacket. The scarf may even be cashmere, far more luxurious than one would expect for a character in these surroundings but certainly not out of character for Boyd Crowder. These episodes also introduce us to Boyd’s enduring habit of wearing his shirts buttoned up to the throat. In “The Hammer” (Episode 1.10), he sports a black flannel shirt with black buttons and a gray chambray shirt. In “Veterans” (Episode 1.11), Boyd wears a light blue chambray shirt, naturally buttoned to the throat. The blue plastic buttons fasten down a front placket with white edge stitching. The patch pocket on the right chest closes with a button-down flap with mitred corners; the left chest pocket is an open square patch with no flap. 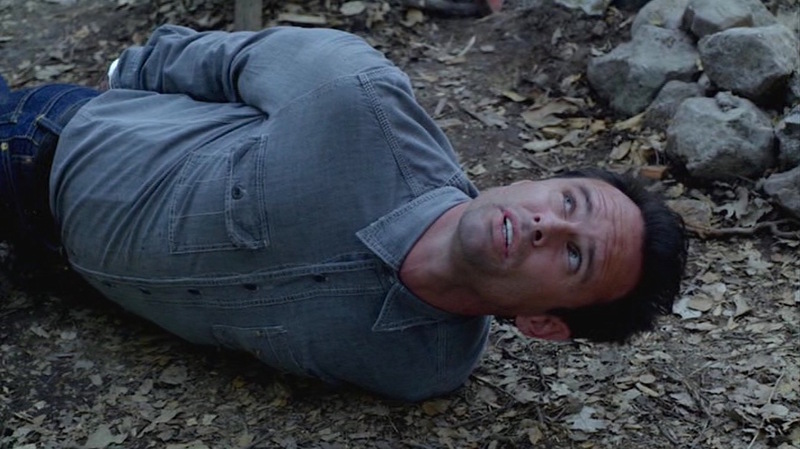 Boyd finds himself in a tight spot in “Veterans” (Episode 1.11). The jacket also makes some sporadic appearances throughout the second season. In “The I of the Storm” (Episode 2.03), Boyd wears the gray sherpa jacket over a dark blue shirt with a subtle gray and green overcheck. 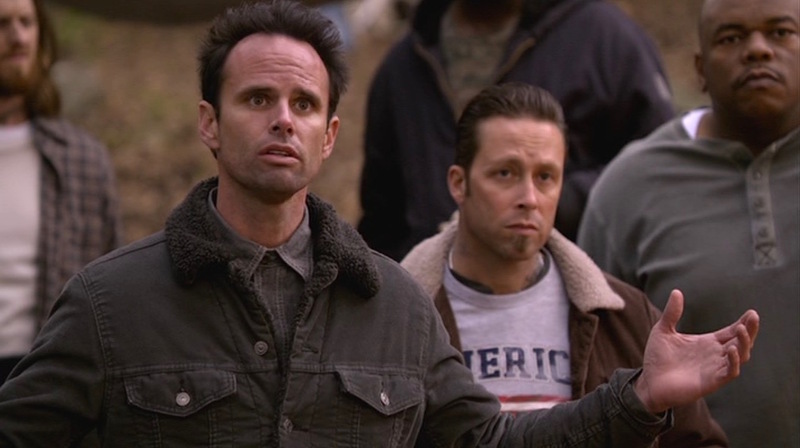 “Save My Love” (Episode 2.07) finds coal miner Boyd arguing at work while wearing this jacket over a colorful flannel shirt in maroon, blue, and orange plaid. Finally, in “The Spoil” (Episode 2.08), he is briefly seen wearing the corded jacket over a white shirt. Of course, all of these shirts are also worn buttoned to the throat. 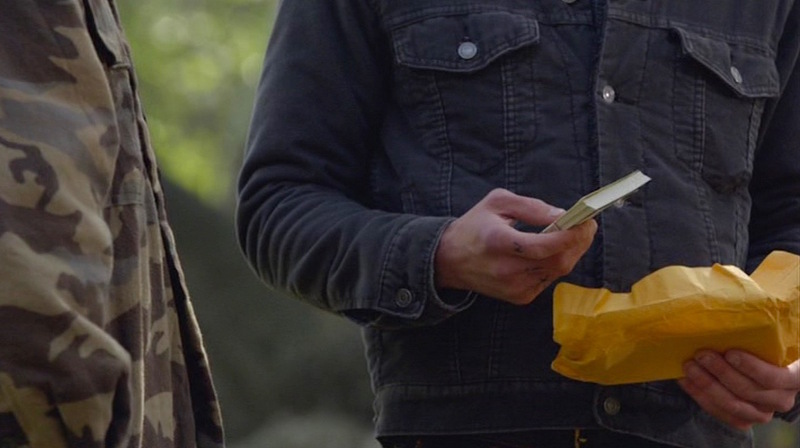 The jacket makes a brief return in “Save My Love” (Episode 2.07) and “The Spoil” (Episode 2.08). 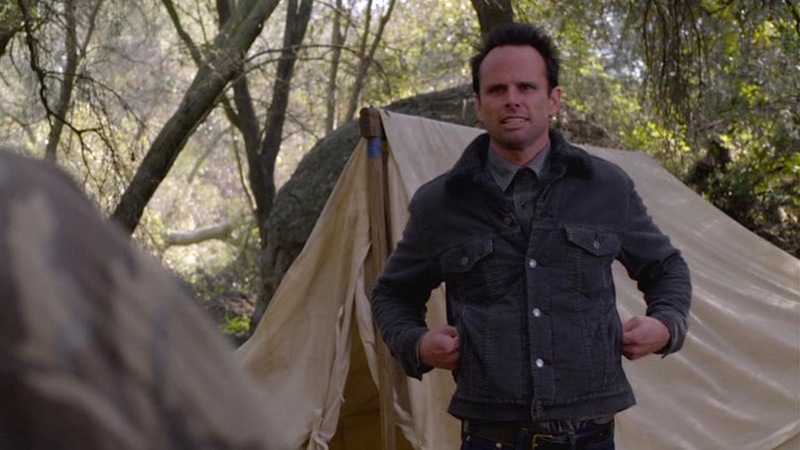 Boyd’s dark blue denim jeans have a “skinny” fit, suitable for the slim-framed Walton Goggins. 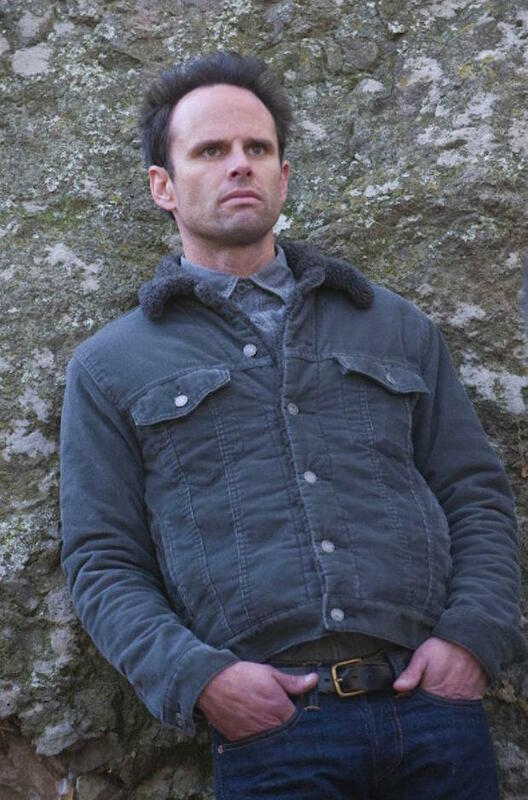 The jeans have narrow cuffs folded at the bottom of the tapered legs, and Boyd wears a smooth dark brown leather belt through the waist loops. Boyd lays down the law for his fellow outlaws. A man of the people – despite his cashmere scarf – Boyd wisely foregoes luxury when choosing his footwear, opting for a pair of well-worn tan leather work boots. The boots are laced through four brass eyelets with at least two brass hooks above them. Still finding his place in Harlan County’s criminal hierarchy, Boyd dresses comfortably with only a hint of luxury sneaking through his badass blue-collar look. He needs to be rugged enough to be able to live and work out in the woods while still commanding respect from his hillbilly flock. 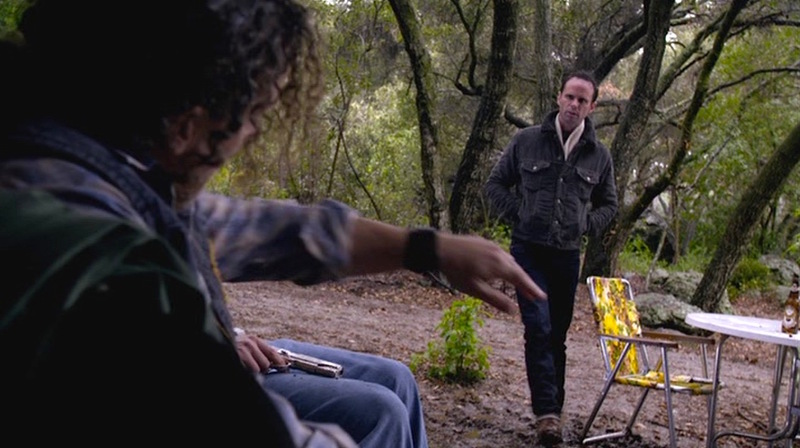 Boyd Crowder first draws his Beretta 92FS, which would go on to become his sidearm of choice in the series, in “The Hammer” (Episode 1.10) when he is trying to get Bobby Joe Packer off drugs. Boyd finds a foolproof way of “getting through” to Bobby Joe. The Beretta 92FS evolved from the original Beretta 92, introduced in 1972. The U.S. military adapted the 92F variant to become the M9 service pistol in the mid-1980s. The 92FS is differentiated from the earlier 92F only by an enlarged firing pin on the underside of the slide to keep the pistol relatively intact should the slide crack. Both the 92F and the 92FS are chambered for the popular 9×19 mm Parabellum round with 15-round standard magazines. Watch the entire series . If you want to see these episodes in particular, check out the first and second seasons. Just know that, like the fine bourbon sipped in the show, Justified gets even better with age. Truth always sounds like lies to a sinner. Just finished season 5. Did no one notice Boyd clearly wearing RRL jeans in the bar with Ava. Blatant focus on the RRL stitching on the coin pocket. They’re the perfect choice for Boyd.